Perth is in Western Australia (WA) and is pretty isolated from the rest of Aus. If you look at it on a map, there are settlements all along the coastline to the North and South but then there is a big bit of nothing in the middle between Perth and the next big city which is just outback (I think – it’s a blank space on my map so I can’t be sure) so it’s understandable why a lot of people never reach here on their travels. I am so glad we did! After our detour to Bali we are back in full ‘explore Australia’ mode. Despite a bit of a delayed departure with Air Asia’s systems being down and us being given a hand written ticket, we eventually got back to Perth, picked up our rental car and drove down to Margeret River (in the South West region of WA). It was funny getting a flight from Asia to Aus as the flight had to be disinfected with some sort of spray when we were about to land and there were lots of warnings about bringing food into the country (not something we experienced when flying from London). On our drive down to Margaret River, a tree had fallen into the road. This tree was enormous and covered the whole road, we have no idea what made it fall and it was pitch black when we reached it. Thankfully there were a lot of cars warning people, flashing you to slow down and lighting the way for you to drive round it. Margaret river is known for its vineyards, caves and forests. We got two out of three ticked off the list on day one. We started by going to Mammoth Cave which is around 20 minutes away from where we were staying. Without a car this area of Aus would be almost impossible to explore! 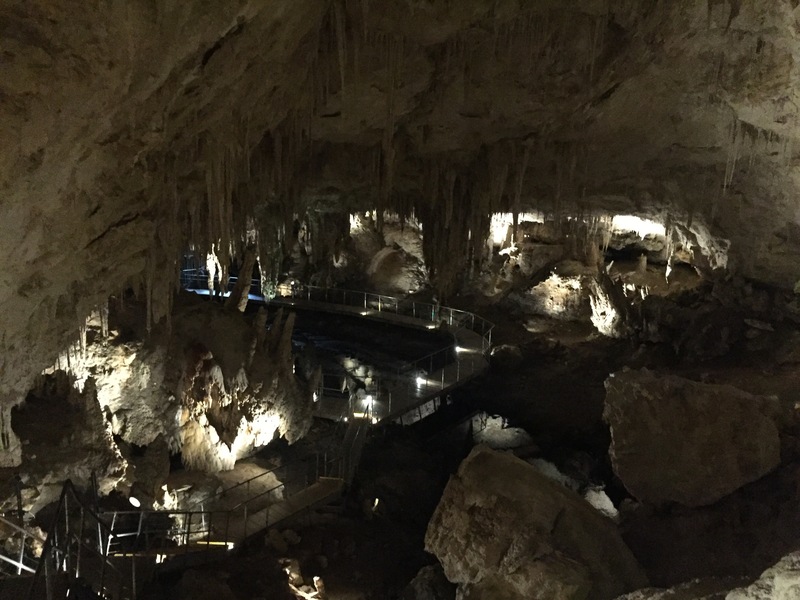 The cave is amazing, it’s 80 metres long and 30 metres deep and full of stalactites and stalagmites glistening in the dim light. Apparently it’s famous for all the bones they have found in there like evidence of a massive wombat looking herbivore that used to roam WA and aboriginals staying here. There was an audio tour to do as you walked about and then you walked up around 160 steps into the bush to get back to the entrance. Next we travelled down the Baranup Drive which is a track through the Karri forests which are famous in WA and can grow up to 90 meters high. These trees have smooth silvery barks and the sheer number of trees makes this place spectacular. I loved just looking out and walking through the trees. There are loads of parrots and the endangered white-tailed black cockatoo is also there – we saw them both! We drove through the forest to Baranup Lookout point which looked out over the forest and to the sea and, on our way back, drove through a section of the forest that was being burnt down to prevent forest fires! There were lots of signs for smoke hazards and we saw fire fighters with flame throwers burning some of the bush. Our final stop for the day was to Redgate which is a very small coastal . We were able to just do a little stop off here as we have the car and so got to see beautiful views of the western coastline. The waves were huge and it was pretty windy so we didn’t stay for too long but it was such a beautiful coastline so we are glad we could to do a stop off here. The next morning we went to the Lake Cave. You have to do a guided tour of this cave and we were in there for around an hour. The cave is really long and is the only one in the area with water in it all year round. 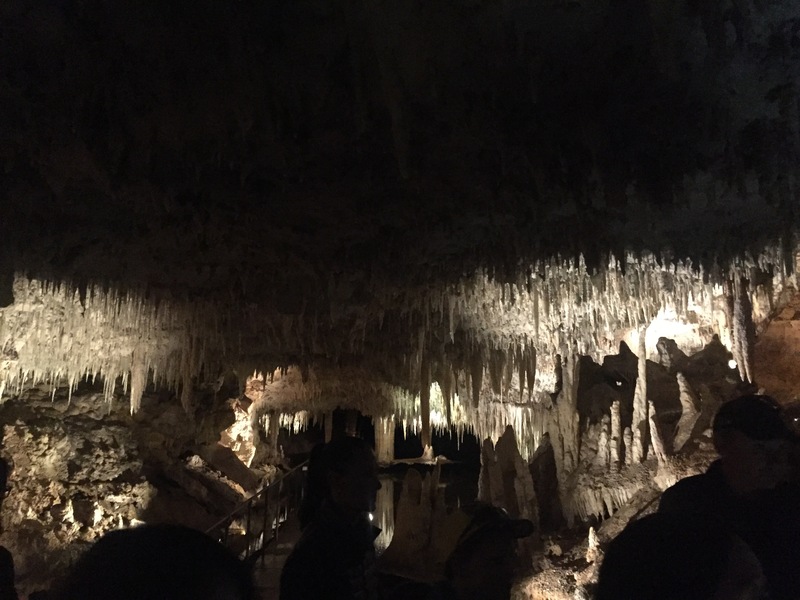 There is a lake running through the length of the cave and there are parts of the cave suspended above the lake where the limestone has eroded away into the lake leaving the crystals hanging from the ceiling. This is called the ‘Suspended Table’ and the weight of one of these is the same as two cars, it is the only known formation of its type in the world. It was cool to see the different types of cave that have formed over millions of years – makes you think what else could be under the ground that we have just never seen before. Margaret River makes 25% of the premium wine in Australia so we had to do a wine tour while we were here! We went to 3 different wineries during the tour and learnt a lot about wine. We don’t really drink wine so didn’t know how we’d get on during the tour (I’m really only used to getting a cheap bottle of rosé for before a night out!) but most of the wines we tried we liked. The red wines were more of a challenge for us but in the final winery we tried a chilled red and a sparkling red which were both nice so maybe getting the wines cooler is the way to go for us! Apparently having a colder red is more common in Australia, I guess due to it getting so hot. I didn’t know that to make white wine they remove the skins off the grapes, that for red wine they keep them on to get a rich colour and for a sweeter wine the grapes are picked later in the harvest. As a rosé drinker, I asked how this was made; turns out it’s often a mix of the different grapes used to make red and white but can be also be from a white wine grape with the skin left on. We also tried a lot of nice food on the tour. We went to a Venison farm and I actually tried little bits of it before giving the rest to Niall (I’m afraid to say I’ve not been converted to eating meat!) but Niall liked it. We went to an olive oil makers and tried a range of flavours of oils, vinegars and chutneys – very nice! I had always wondered what it meant by ‘extra virgin’ olive oil and it means that the olives have only been pressed once and then discarded to get the oil from them – just incase you had been wondering too. The Margaret River Dairy Company had a sample of really nice cheese for us to try and we went to a chocolate shop which also gave out free samples. People on the tour bought a lot of the produce from everywhere we visited but, as we are on a budget, we just took as many free samples as we could! It’s incredible the amount of things actually produced in this region. One of the wineries (Bettaney’s) also made nougat so we also tried three different types of nougat. They also made nougat liqueur which I really liked but Niall didn’t as it used coconut cream and he isn’t a fan of coconut (it just meant I could have his taster so it was a win for me!) In the last winery of the day, the wine maker brought in a freshly bottled fortified wine (a ‘campfire red’) which didn’t even have a label on yet and we were able to try it. It was very sweet and apparently is more like a port – this was probably my favourite of everything we tried. A backdrop to our wine tour was the US Presidential Election. 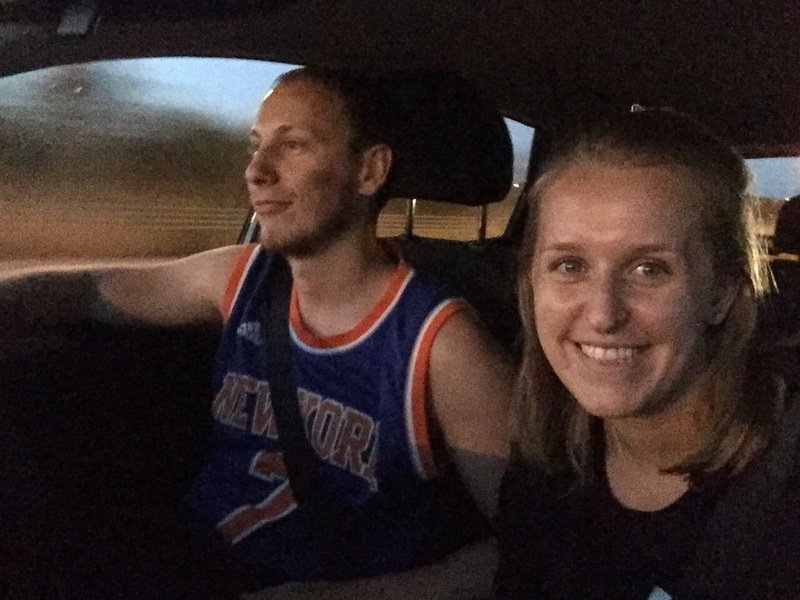 We got regular updates from a pair of Aussie’s who had Internet on their phones and it definitely made it easier drinking the wine once we knew the result. President Trump – can’t quite believe it! Despite this news, it was a really good tour and we are really glad we did it – especially as it’s likely to be the fanciest food we’ll be having on our entire trip!